This OSHA 16 Hour HAZWOPER Upgrade (to the 40 Hour) – Online/Class Combo course helps workers upgrade to the 40 Hour HAZWOPER level after completion of 24 Hour HAZWOPER training. This training meets the Federal OSHA HAZWOPER training requirements of 29 CFR 1910.120(e)(3)(iv) and 29 CFR 1929.65(e)(3)(iv). The first eight hours of the course are provided 100% online as a fully narrated class. The final eight hours of the course are taken in a classroom setting, where students get hands-on practice using the equipment and donning/doffing. View current classroom locations and schedule. This OSHA 16 Hour HAZWOPER Upgrade (to the 40 Hour) Online/Class Combo course is designed for workers who have completed their 24 Hour HAZWOPER training and want to upgrade to the 40 Hour HAZWOPER training level. This training meets the Federal OSHA HAZWOPER training requirements of 29 CFR 1910.120(e)(3)(iv) and 29 CFR 1929.65(e)(3)(iv). This combination online/classroom course is a good option for workers who want the flexibility and convenience of an 8 hour online course, coupled with 8 hours of hands-on equipment instruction and practice in a classroom setting. Students complete the online portion first through our state-of-the-art Online Training System (OTS), and then may attend the 8 hour classroom portion of the training. View current classroom locations and schedule. To request hands-on classroom training be added in your area, please contact us. Through affiliate partnerships with other training providers, we work to provide locations across the United States for the hands-on training. To ensure the highest quality training, we are very selective in choosing our affiliates. We also offer an OSHA 16 Hour HAZWOPER Upgrade Online course as an option, which provides this course entirely online. This 100% Online course would be suitable for workers who will not be using equipment on the job OR for workers who will use equipment on the job, but will have employer-provided hands-on training on the specific equipment they will use. Students who took the 24 Hour HAZWOPER course from another training provider, and enroll in our OSHA 16 Hour HAZWOPER Upgrade Combo course, must provide acceptable documentation of 24 Hour course completion before the 40 Hour HAZWOPER certificate can be provided. The first 8 hours of the course are 100% online and fully narrated. The training is self-paced, available 24/7, and taken through our advanced Online Training System (OTS). The final 8 hours of the course are held in a classroom setting, and includes hands-on equipment instruction and practice. Designed by Certified Outreach Trainers, this course includes up-to-date, high quality training created with your safety and learning as our top priority. The HAZWOPER Online training portion features interactive training modules, which combine audio and visual elements for maximum retention. The first eight hours of the course are completed entirely online using a computer with an internet connection and this training is available 24/7. For your convenience, it can be completed over time, and your progress will be saved to the last section completed. Our HAZWOPER classes provide students hands-on access to examples of specialized equipment, where they can practice donning/doffing and using the equipment. The equipment we train with in the classroom may vary slightly from the specific equipment that you will use as part of your job. Any worker required to use specialized equipment must be trained on the proper use of their specific equipment prior to use. Students are given 6 months to complete the course after enrollment. We are so certain you will be satisfied with your experience, that we offer a 100% Money Back Guarantee*. Once the online and classroom course training is complete, you will immediately be able to download, save or print your Course Completion Certificate which is provided in PDF format. Within 24 hours of course completion, you will also be mailed a PVC credit card style Wallet ID Card with optional photo, showing training course completion. General site workers (such as equipment operators, general laborers, and supervisory personnel) engaged in hazardous substance removal or other activities which expose or potentially expose workers to hazardous substances and health hazards shall receive a minimum of 40 hours of instruction off the site, and a minimum of three days actual field experience under the direct supervision of a trained experienced supervisor. The online HAZWOPER training portion of this course consists of 3 modules, which include 25 sections that must be completed sequentially. The sections are fully narrated and interactive. Quiz questions within each section help the student retain knowledge that will be needed for the module exams. Once the student has completed the online portion of the course, they may attend the 8 hour hands-on classroom portion. This course includes 3 exams. One exam must be taken after the completion of each of the 3 online modules. Each exam consists of 10 questions, which are randomly compiled from a large pool of possible questions. A 70% or better score is needed in order to pass each exam. If a student does not pass, they may re-review information in the modules and sections as necessary, and retake the test as many times as needed in order to pass. This OSHA 16 Hour HAZWOPER Upgrade Combo course was designed by Certified Outreach Trainers and is OSHA accepted. The course meets the Federal OSHA HAZWOPER requirements for 29 CFR 1910.120(e)(3)(iv) and 29 CFR 1929.65(e)(3)(iv). Once the online and classroom course training is complete, you will immediately be able to download, save or print your 16 Hour HAZWOPER Certificate of Course Completion which is provided in PDF format. Within 24 hours of course completion, you will also be mailed a PVC credit card style Wallet ID Card with optional photo, showing training course completion. 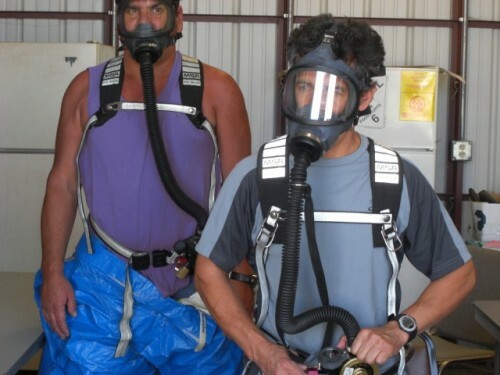 To comply with OSHA regulations, all HAZWOPER training must be refreshed annually. Please note that this OSHA HAZWOPER training course provides valuable hazardous waste operations and emergency response training information which applies to a general population of employees. This course is not meant to replace company-specific or function-specific training provided by your employer on equipment use and procedures for your particular work environment. Workers who take the OSHA 40 Hour HAZWOPER course completely online may need additional training if they are required to use the equipment discussed during training. If a worker is going to use protective equipment or PPE on the job, they must be trained on proper use of the equipment prior to use. You must be trained by your employer on the hazards, equipment, engineering and administrative controls, safe work practices, policies and procedures and emergency plans specific to your role and workplace.